For many divorcing couples, separating bank accounts is difficult and a source of animosity. Seeking the assistance of an experienced divorce lawyer is essential for protecting your interests and ensuring the divorce process runs smoothly and fairly. Family law attorney Karen S. Brown is knowledgeable in all facets of the divorce process and can protect your interests in your divorce. For answers to your questions about divorce and bank accounts, contact our Los Angeles, CA offices to schedule a consultation. When dividing assets in a divorce, the courts and divorce lawyers will look at all bank accounts as either community property or separate property. Community property is split equally in a divorce, while separate property may stay with whichever spouse is deemed the sole owner. While this may make it seem that separate accounts would fall under the category of separate property, that is not always the case. Find out more as we take closer look at how bank accounts are treated in a divorce. When Are Bank Accounts Divided Equally? Assets acquired during a marriage are typically viewed as community property. When it comes to bank accounts, this means that bank accounts established after a marriage, whether joint or separate, belong to both spouses and will need to be equally divided in the event of a divorce. Separate bank accounts that were established prior to a marriage may also be considered community property provided the account was used after marriage. This also means that nearly all funds, including regular paychecks, placed into the account after marriage would need to be divided. Why Are Separate Accounts Not Treated as Separate? To better understand why separate accounts are often not treated as separate in a marriage, it helps to understand the concept of commingling. In simplest terms, commingling is when assets are combined for common use. Commingling can complicate matters with separate accounts and funds that were in an account prior to marriage. 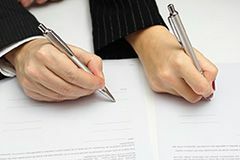 Adding a spouse's name to a previously separate account generally makes whatever funds were in the account, or added later, commingled and eligible for division in a divorce. Even if only one spouse's name is on the account, commingling may still have occurred if both spouses used the account. In such circumstances, an argument could be made by either spouse's divorce attorney that funds should be divided or remain separate. When Are Bank Accounts Kept Separate? As previously explained, keeping separate bank accounts during a marriage does not guarantee funds will remain separate in the event of a divorce. However, it is possible to protect a separate account from being divided in divorce if the bank account truly remained separate throughout the duration of the marriage. No community property funds, including money earned during the marriage, were placed into the account. Adding income earned during the marriage into a separate account commingles the account. The other spouse's name was never added to the account at any time during the marriage and no funds were placed into the account. Inheritance or gifts placed into a separate account may be viewed as separate property provided that the account has not been commingled. If both spouse's names are included in the inheritance or gift, then the funds would be considered commingled and require equal division. If you are facing a divorce, you need an experienced divorce lawyer on your side. Divorce lawyer Karen S. Brown is here to help you in your time of need. Contact our offices today to schedule a consultation.